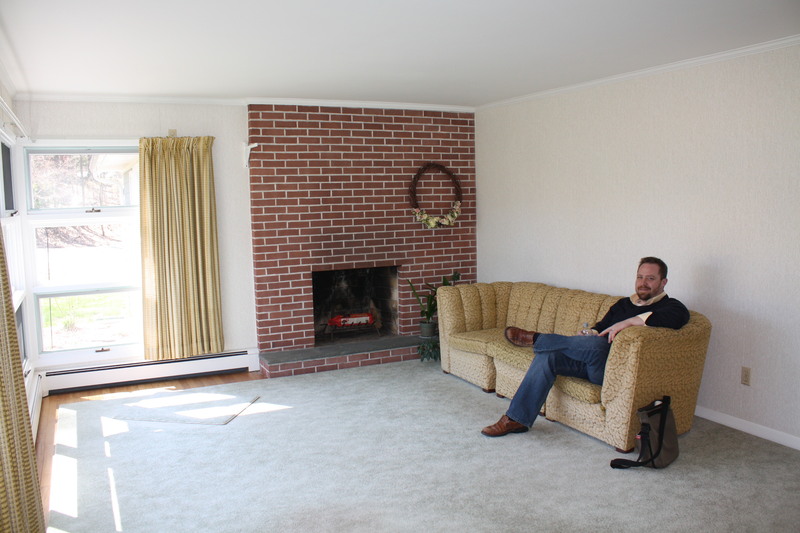 The one thing on my checklist for the summer was to redo the living room. (Ok, I had way more on my checklist, but this was the biggest one.) 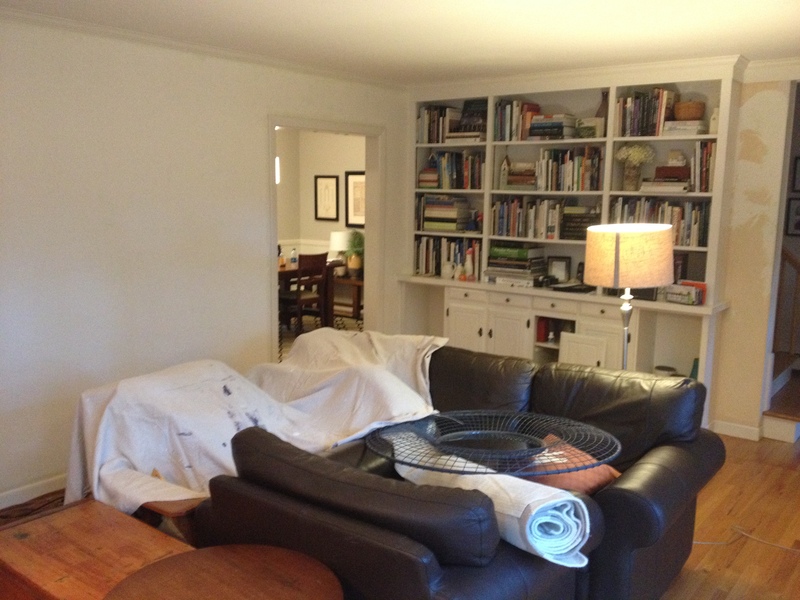 We’re narrowing down to the final rooms of wallpaper, and with the kids gone for two weeks, I knew we could keep the house a mess while we finished the big task. It was the perfect time for a makeover. My arms had finally recovered from the bathroom, our paint brushes were dry, and my steamer was itching to get back to work. We started with a great space. 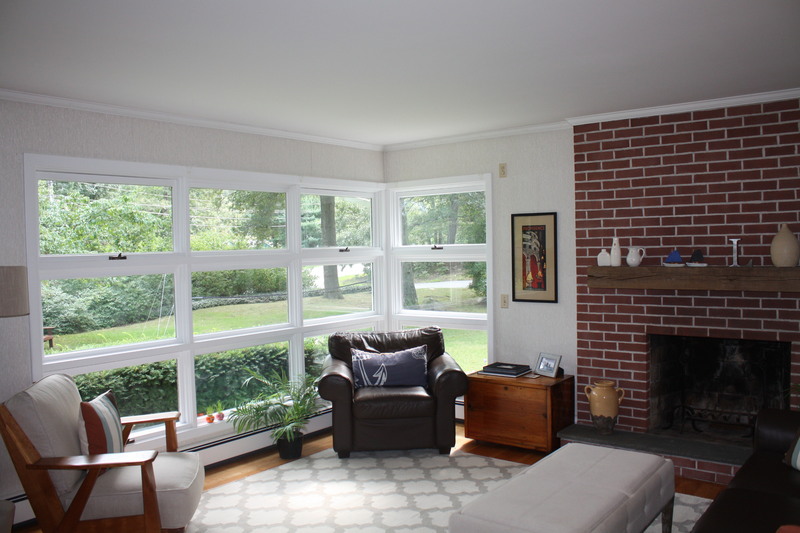 We absolutely love the corner windows! A great perk of this 60’s style ranch. 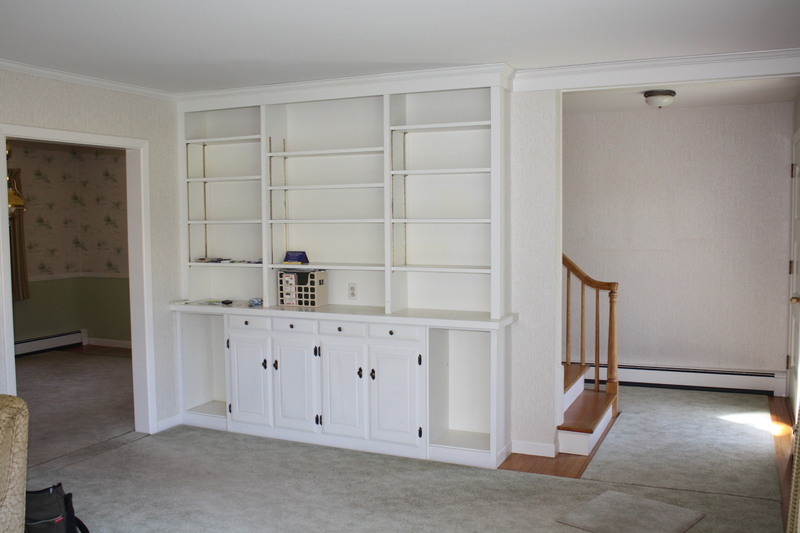 It’s a big room with the fireplace on one end and built-in bookshelves on the other. The current furniture layout in the above pictures seemed to be the best arrangement to take advantage of the view and wall space. We certainly tried other arrangements including having the couch right in front of the windows (leaving the big wall open for a large screen TV? ), but ended up back where we began. 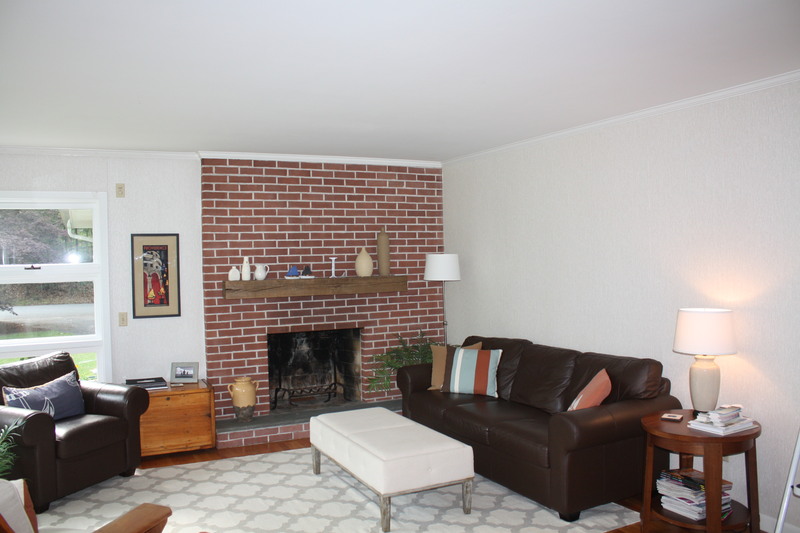 The other great feature of the living room is the brick fireplace. Before Christmas, we had put up the reclaimed wood mantel, but knew that wasn’t enough to make it pop. I had wanted to go white, and while Jeremy was a little nervous about it, he finally agreed. So the only thing left to decide on was the wall color. Oh! What a process! From a dark blue to gray to white to light blue… Just too many choices. 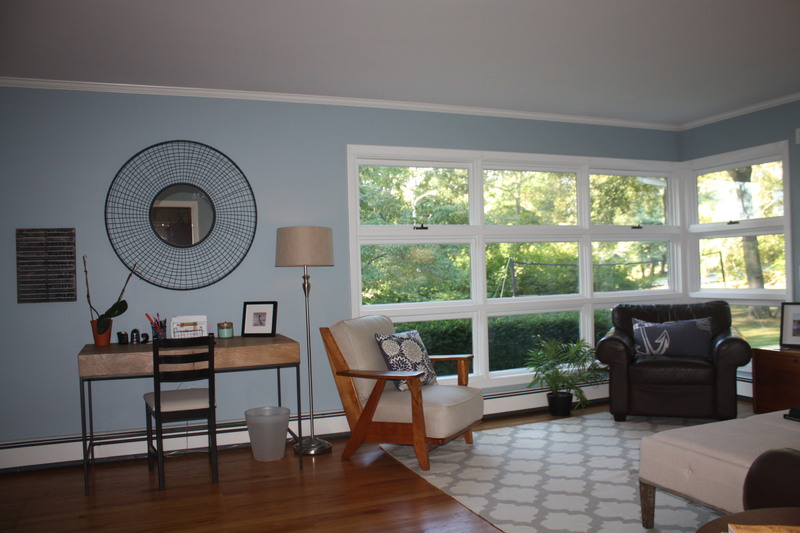 In the end, we chose a blue-gray called Nantucket Fog from Benjamin Moore. Seems appropriate considering we live in Rhode Island and love Nantucket. 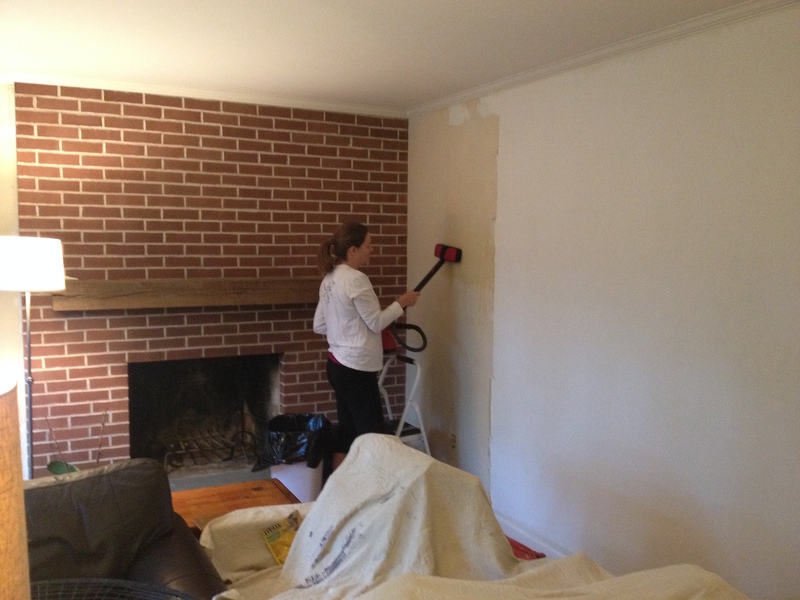 Wallpaper removal – my “favorite” part. And living among a mess for almost two weeks. My back and shoulders were definitely feeling the pain after all the wallpaper removal, but I forged on. 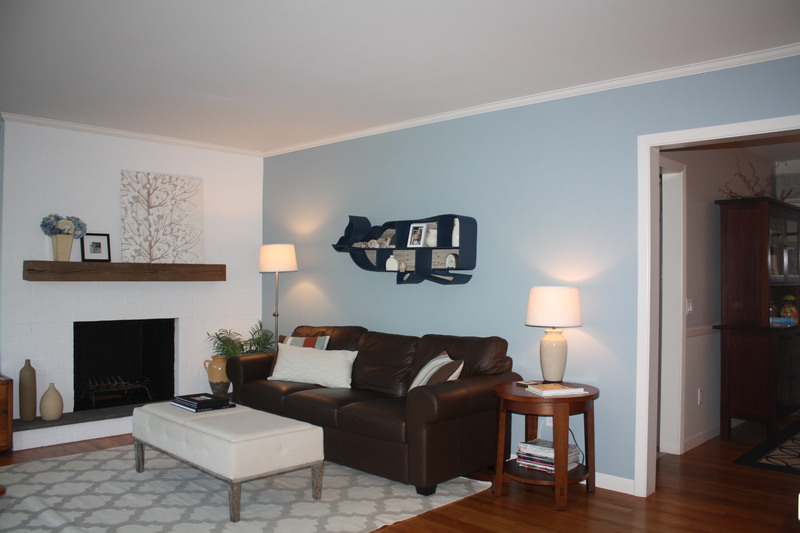 Nantucket Fog finally went on the walls, and then it was time for decorating. The wall behind the sofa is the biggest wall in the room and therefore needed a big piece of art. We struggled so much with what to put there. A triptych? A large canvas? Multiple pieces? 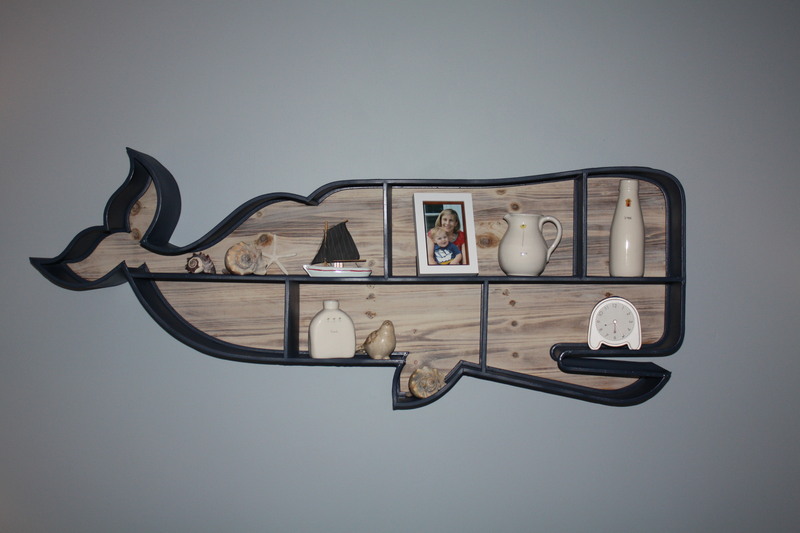 But then, as if the heavens opened up and light shone down, we found a big whale bookcase. We were shopping in Towson at one of my fave stores, Su Casa, when the whale spoke to us. In the store, he was more distressed teal, and we decided he could go in our basement if the color didn’t work in the living room. But we loved it so much, we just decided to spray paint him to match. He is now a nice navy blue, and looks perfect against the Nantucket Fog. 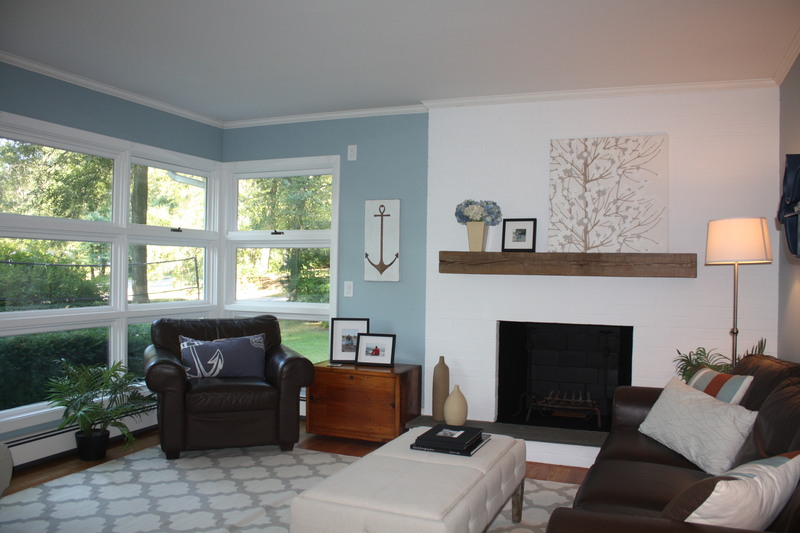 Love, love, love the fireplace with the beech wood mantel! The green of nature still pops in the big windows. There you have it! Another room checked off. Next up will be the hallways, but we’ll wait until winter when there is nothing to do outside anymore. For now, it’s back to the yard for a little outdoor TLC. Summer is just about over and life starts getting much busier. But I’ll still try to keep everyone up to date on the fam’ and our fall fun. Next on the blog will be some posts on how we ended the summer. My how time flies!